PART 3: LETS RUN TRAINS YORK RAILWAY MODELLERS. Our Friday Night Operating Group spent an evening running trains at the Adirondack Branch D&H HO Scale Model Railroad. We had a blast. These three videos capture the action. Enjoy. 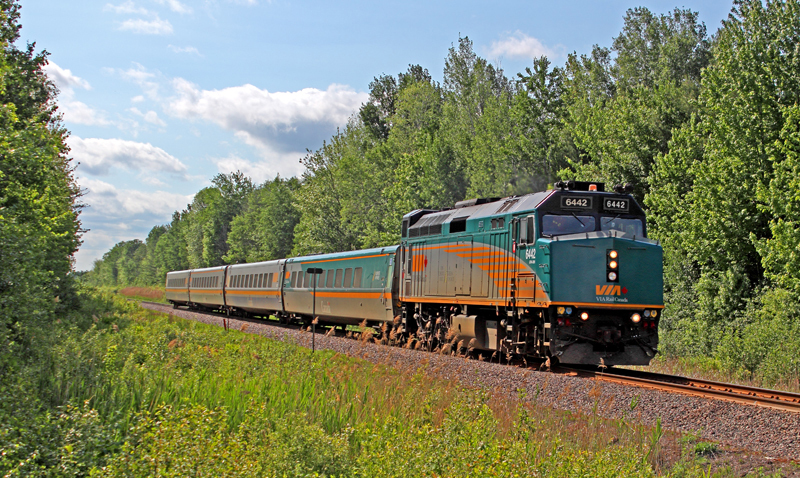 Thursday afternoon 28 May 2015, I decided to do a little railfanning between Carlsbad Springs and Casselman. Taking Russel Road east I turned south on Sand Road until I got to the RR crossing A quiet place I set up on the south side and waited for Train 28 from Ottawa to Montreal. One issue with east-bounds in the afternoon is that you are shooting into the sun so the light reflects on quite a bad angle at the train and into the camera creating glare and deep shadows. So I needed to photoshop using shadow highlight adjustments to get a reasonable post. Not long after Train 55 came through westbound.. The sun was at a perfect angle. I then decided to look for a new location for the next train coming out of Montreal. I drove east to the RR crossing at Baker Road which is between Gagnon and Casselman. The location again had an excellent sun angle for west-bounds and the right of way was very clear with trees on both sides. Looks like they were planning to do tie replacement. This is train 59 from Montreal to Ottawa. My final move was to the South Nation River in Casselman. There is a vacant lot on the south east side of the rail bridge with a road and parking area. The trains blow for crossings so you know when they are coming. The first train at this location was East bound Train 38. It slowed and stopped at the Casselman Station. There is a passing siding just east of town and I think it waited there for the next train from Montreal. And there it is Train 37 heading for Ottawa. The afternoon schedule allowed for some good VIA RAIL action. 5 trains in roughly 2 hours. A nice little outing to enjoy the great outdoors and trains. A full operations session. Operating an interchange yard on a model railroad. Bill Scobie's Sn3 railroad depicts a bridging route that spans the San Juan Mountains in Colorado. The Trains come from the D&RGW Montrose staging tracks onto the layout and are interchanged with the RGS in Ridgeway. The yard is a scene of busy switching action as trains from the previous ops session come in and leave for staging, depart for Placerville, Vanadium, Vance Junction. From there, the Telluride Branch feeds the town and Pandora Mines. Continuing on the main past Vance Junction you pass through Lizard Head and descend past Trout Lake, Opher Mine to Rico. At Rico the trains are interchanged with the D&RGW and go to Durango Staging. Ridgeway also receives trains from the RGS at the end of the session. This allows for the ops cycle to continue next session. All this traffic generates an interesting ops plan that manages cars over multiple sessions using Rail Op software. If you were ever interested in seeing how this kind of operational modeling works... this video series may be for you. Bill Explains how to use staging and how the interchange works and you get to follow along through an ops session. There are instructional subtitles to keep you on track so to speak. Enjoy.